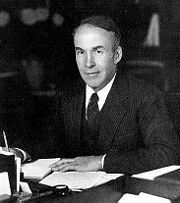 Archibald MacLeish (May 7, 1892 – April 20, 1982) was an American poet, writer, Librarian of Congress, and three-time winner of the Pulitzer Prize. He is closely associated with the Modernist school of poetry, and he was greatly influenced in particular by the poetry of Ezra Pound and T.S. Eliot. Like Pound and Eliot, MacLeish eschewed some of the stricter rules of traditional verse; but throughout his life MacLeish's poetry retained a certain simple lyricism that set him apart from his more experimental colleagues. Renowned as a teacher, critic, and poet, MacLeish has been sadly underappreciated by subsequent generations of writers, though there remain a handful of poets who discover his poetry and, in it, discover one of the most thoughtful poets in the American canon. In contrast to Eliot, who gave up his American citizenship to become an Englishman, and Pound, who supported Mussolini during the Second World War and would be tried for treason, MacLeish was one of the few poets of his generations to openly and ardently defend the cause of American democracy and political freedom. In fact, MacLeish's politics have contributed somewhat to his obscurity, as many of his fellow poets and critics shunned him for taking a pro-American stance. In addition to his poetry—which, as the years go by, is slowly attracting the critical acclaim it deserves—MacLeish was also an accomplished playwright, and he would win his third Pulitzer Prize for J.B., a play based on the Old Testament's Book of Job. MacLeish has long been an underdog in the history of twentieth-century American poetry, but he has not been totally ignored; his poem Ars Poetica is one of the most widely-anthologized in the English language, and is considered to be one of the clearest statements of the Modernist aesthetics ever written, and his brief lyric You, Andrew Marvell is viewed as one of the greatest poems ever written in traditional verse-and-meter by an American. MacLeish, like Randall Jarrell and John Crowe Ransom, is often categorized as a "major minor poet," and though he has been overshadowed by some of his more prominent contemporaries, he is nevertheless an artist of major quality. MacLeish was born in Glencoe, Illinois. His father, Andrew MacLeish, worked as a dry-goods merchant. His mother, Martha Hillard, was a college professor. He grew up on an estate bordering Lake Michigan. He attended the Hotchkiss School from 1907 to 1911, before moving on to Yale University, where he majored in English and became a member of the Skull and Bones secret society. He then enrolled in the Harvard Law School. In 1916, he married Ada Hitchcock; the couple would remain together, happily, to the end of MacLeish's life. His studies were interrupted by World War I, in which he served first as an ambulance driver and later as a captain of artillery. He graduated from the law school in 1919. He taught law for a semester for the government department at Harvard, then worked briefly as an editor for The New Republic. He next spent three years practicing law. In 1923, MacLeish famously resigned from his law firm on the day he was to receive a promotion. He moved with his wife to Paris, where they joined the community of literary expatriates that included such figures as Gertrude Stein and Ernest Hemingway. He returned to America in 1928. From 1930 to 1938, he worked as a writer and editor for Fortune Magazine, during which he also became increasingly politically active, especially with anti-fascist causes. He was a great admirer of Franklin Delano Roosevelt, who appointed him Librarian of Congress in 1939. According to MacLeish, Roosevelt invited him to lunch and "Mr. Roosevelt decided that I wanted to be Librarian of Congress". MacLeish held this job for five years. Though his appointment was officially opposed by the American Library Association because of his lack of professional training as a librarian, he is remembered by many as an effective leader who helped modernize the Library. During World War II MacLeish also served as director of the United States War Department's Office of Facts and Figures and as the assistant director of the Office of War Information. These jobs were heavily involved with generating pro-American propaganda, which was well-suited to MacLeish's talents; he had written quite a bit of politically-motivated work in the previous decade, and during this time he wrote, among other things, a pair of pro-American, anti-fascist radio-plays that were popular among general audiences but cost MacLeish the friendship of some his more bohemian friends. He spent a year as the Assistant Secretary of State for cultural affairs and a further year representing the U.S. at the creation of UNESCO. After this, he retired from public service and returned to academia. In 1949, MacLeish became the Boylston Professor of Rhetoric and Oratory at Harvard University. He held this position until his retirement in 1962. In 1959, his play J.B. won the Pulitzer Prize for Drama. From 1963 to 1967, he was the John Woodruff Simpson Lecturer at Amherst College. MacLeish's early work was very traditionally modernist and accepted the contemporary modernist position holding that a poet was isolated from society. He later broke with this position, believing that a poet must take an active role in the social causes of his or her times. MacLeish himself was greatly involved in public life and came to believe that this was not only an appropriate but an inevitable role for a poet. J.B. is a play in verse, written by MacLeish and published in 1958. Written in response to the horrors the author saw in the world around him (such as the Holocaust and the Atomic bombings of Hiroshima and Nagasaki); it is based on the Book of Job from the Old Testament. The play is set in a modern circus. Two vendors, Mr. Zuss and Nickles, begin the play-within-a-play by assuming the roles of God and Satan, respectively. They watch J.B., a wealthy banker, describe his prosperity as a just reward for his faithfulness to God. Scorning, Nickles challenges Zuss that J.B. will curse God if his life is ruined. The vendors observe as J.B.'s children and property are destroyed in horrible accidents and the former millionaire takes to the streets. J.B. is visited by three Comforters (representing History, Science, and Religion) who offer contradicting explanations for his plight. He declines to believe any of them, instead calling out to God to show him the just cause for his punishment. When finally confronted by the circus vendors, J.B. refuses to accept Nickles' urging toward suicide to spite God or Zuss' offer of his old life in exchange for quiet obedience to religion. Instead, he takes solace in his wife Sarah and the new life they will create together. As a play, J.B. went through several incarnations before it was finally published. MacLeish began the work in 1953, as a one-act production but within three years had expanded it to a full three-act manuscript. The resulting work won the 1959 Pulitzer Prize for Drama. MacLeish worked to promote the arts, culture, and libraries. Among other impacts, MacLeish was the first Librarian of Congress to begin the process of naming what would become the United States Poet Laureate. The Poet Laureate Consultant in Poetry to the Library of Congress came from a donation in 1937 from Archer M. Huntington, a wealthy ship builder. Like many donations it came with strings attached. In this case Huntington wanted the poet Joseph Auslander to be named to the position. MacLeish found little value in Auslander’s writing. However, MacLeish was happy that having Auslander in the post attracted many other poets, such as Robinson Jeffers and Robert Frost, to hold readings at the library. He set about establishing the consultantship as a revolving post rather than a lifetime position. In 1943, MacLeish displayed his love of poetry and the Library of Congress by naming Louise Bogan to the position. Bogan, who had long been a hostile critic of MacLeish’s own writing, asked MacLeish why he appointed her to the position; MacLeish replied that she was the best person for the job. For MacLeish, promoting the Library of Congress and the arts was vitally more important than petty personal conflicts. Two collections of MacLeish's papers are held at the Yale University Beinecke Rare Book and Manuscript Library. These are the Archibald MacLeish Collection and the Archibald MacLeish Collection Addition. "We are deluged with facts, but we have lost or are losing our human ability to feel them." "What is more important in a library than anything else—is the fact that it exists." "A man who lives, not by what he loves but what he hates, is a sick man." This page was last modified on 25 November 2016, at 22:32.